Piaggio has successfully removed the pilot from the Italian aircraft manufacturer's popular twin-engine, turboprop, pusher-type executive transport. The P.180 – affectionately referred to as "the flying catfish" – has been redesigned into an unmanned aircraft for the Italian Air Force, and it's got a new name: the Hammerhead. The new P.1HH HammerHead is a multi-purpose drone powered by two Pratt & Whitney Canada PT6-66B turboprop engines designed to perform intelligence, surveillance and reconnaissance missions worldwide. Capable of flying up to 45,000 feet with an endurance exceeding 16 hours with an internal payload up to 4,000 lbs, the Hammerhead includes a ground control station that can be interconnected with the drone in Line of Sight or via satellite. 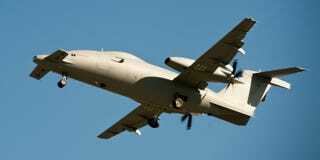 The maiden flight of Prototype 001 was completed last December at the Trapani Birgi Italian Air Force base. That came after the completion of the P.1HH UAS demo program and represents the starting point of a comprehensive development and certification flight test campaign. That will enable Piaggio to quickly deliver the most advanced Medium-Altitude Long-Endurance (MALE) unmanned systems to market. The Prototype 001 follows on the success of the demo program that first got off the ground in late 2013 utilizing a highly modified P.180 Avanti. We are very pleased with the result of the maiden flight. The aerial vehicle was seamlessly operated remotely with no experienced flaws. We were also able to gather significant data which will enable us to forge ahead with our ambitious development roadmap. The Prototype 001 is representative of the final aerodynamic configuration of the aircraft including the new, extended span main wing and the control systems on board. During the first flight, the Prototype 001 performed a shakedown flight over the Mediterranean Sea at a significant range of speed and altitude. The main flight objective was to conduct a first check of all the essential functions of the Air Vehicle and Ground Segment.